The TRAK ATTAK puts a new spin on playing with radio control cars as this RC racer features tracks instead of wheels to speed it along. 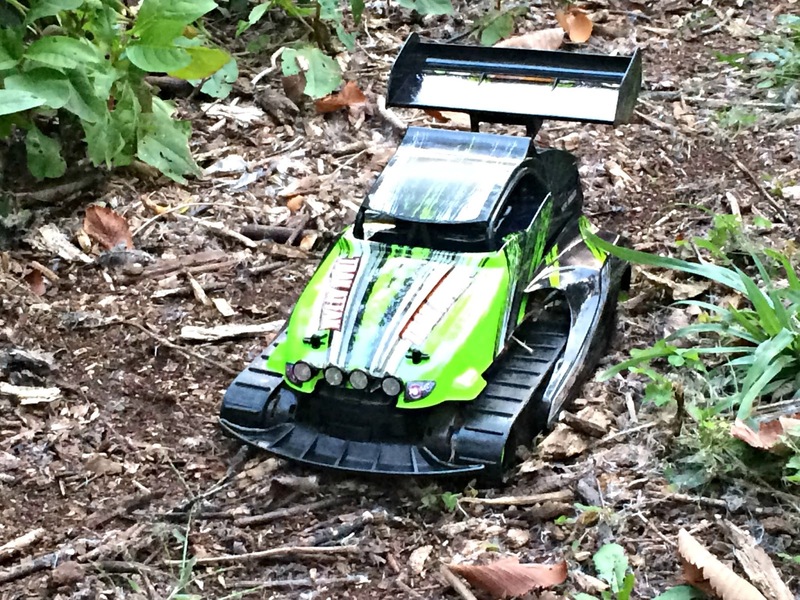 This 1:10 scale (14") tread driven vehicle features a sturdy suspension and enough bulk in its size to let it tank through a variety of terrains. Yet it is light and fast enough to really get it racing along. 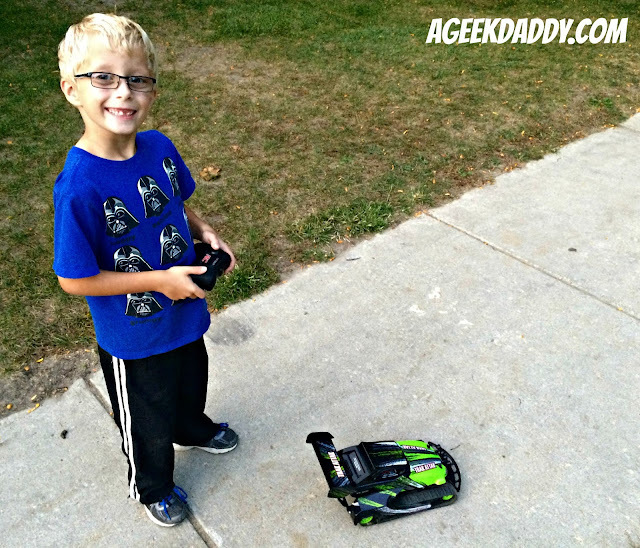 A Geek Daddy recently put the TRAK ATTAK to the test and it proved itself to be an entertaining toy as it jaunted across backyards, through park playgrounds and around our neighborhood's sidewalks. 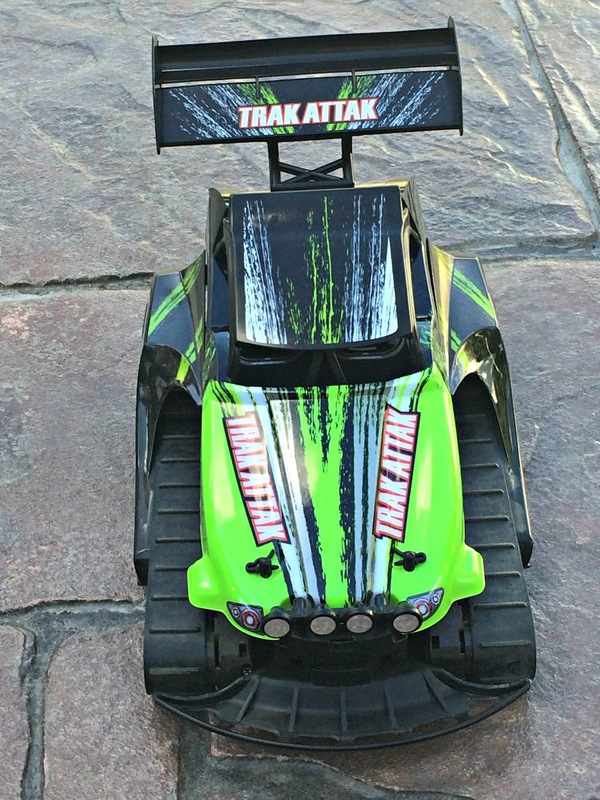 The TRAK ATTAK comes with its own compact remote control. I don't particularly care for my kids wanting to grab my phone to be able to play with a toy through its bluetooth or wi-fi so an included remote control with these type of things is always a plus for me. This parent also appreciated that New Bright included the 2 AA batteries needed to power the remote control within the packaging. 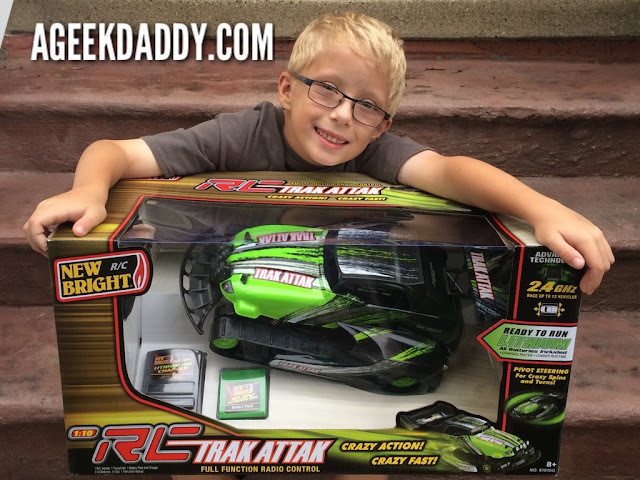 Pull the TRAK ATTAK out of its box, insert the included batteries into the remote control and charge the Lithium Ion power pack for a few minutes and this RC racers is quickly ready to play with. There have been quite a few radio control cars that my twins have wanted to race against each other that didn't work out very well when we tried them out because the frequencies interfered with one another causing a mess in controlling both so they couldn't really compete against one another at the same time. 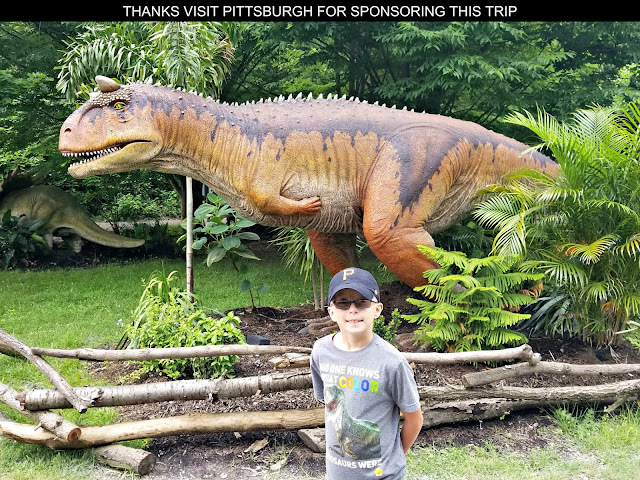 That won't be a problem with TRAK ATTAK which utilizes 2.4GHZ technology that allows remote control units sync to specific vehicles. This allows up to 6 people to race at once in proximity to one another at the same time -- yes!!! New Bright's technology also allows the TRAK ATTAK to have an internal antenna so there isn't one hanging from the vehicle providing for more mobility and a more attractive ride while also providing a faster response between transmitter and vehicle from longer distances.